The major players active in human machine interface market are Honeywell International Inc., Emerson Electric Corp., ABB Ltd., Rockwell Automation Inc., Rittal GmbH & Co, General Electric Co., Interlink Electronics, Inc., WECON Technology Co. Ltd, EAO AG, Panasonic Corp., Siemens AG, Omron Corp., and Eaton Corp. According to the analysts at Zion Market Research, global human machine interface market was capitalized at almost USD 3.43 Billion in 2016 and is likely to cross almost USD 5.70 Billion by end of 2022, developing at a CAGR of slightly more than 8.80% from 2017 to 2022. Increasing need for reliable hardware and data security paired with strong demand for efficient & reliable software & system are enforcing to fuel the growth of human machine interface market. Increasing requirement from various sectors such as oil & gas, manufacturing, healthcare, and aerospace & defense is offering traction to the human machine interface market. On the other hand, complex designing structure and high installation cost of HMI is hindering the development of global human machine interface market. Nevertheless, technological advancements in HMI will be likely to power the requirement of human machine interface market. For example, voice recognition, improvements gesture recognition, touch screen modules, touchless sensing, augmented reality, and wearable technology are mounting productivity & safety in various sectors that is likely to fuel the growth of human machine interface market. Moreover, new HMI solutions are pre-configured to convey info to an on-premise solution or the cloud. Hence, the roll out of IoT is altering the manufacturing factories, thereby fostering the development of human machine interface market. 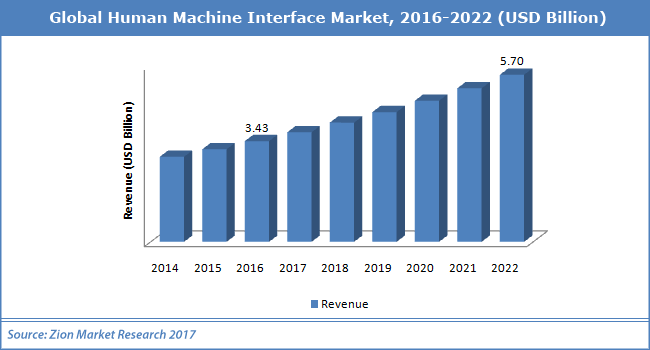 Moreover, increasing M&A initiatives by market players are also responsible for the development of human machine interface market. For example, in July 2017, ABB concluded the acquirement of B&R, the biggest independent operator focusing on the open-architecture and software & product-based solutions for factory & machine automation universally, fostering the human machine interface market. The global human machine interface market is segmented into the configuration type, component, region, and application. By component, the human machine interface market is divided into software and hardware. Hardware sector in human machine interface market will be likely to hold the biggest share in the coming years due to rising usage of various devices for discrete applications. Based on configuration, the human machine interface market is divided into embedded HMI and stand-alone HMI. Based on application, the human machine interface market is bifurcated into oil and gas, energy and power, automobiles, healthcare, defense, aerospace, and others. Manufacturing sectors are powering the growth of human machine interface market owing to increasing requirement to elevate monitoring & efficiency of manufacturing plants.